Book online and get FREE delivery and collection for up to 3 units to the UK Mainland (excludes Highlands and Islands) with a standard delivery of 3 working days. For urgent hires, more units or for a requirement located outside the UK mainland - please use the "Bespoke Hire" button or call +44 121 770 0593. 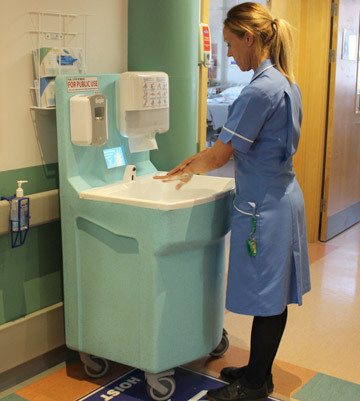 Teal's flagship mobile hand wash unit comes complete with a video screen that provides appropriate hand washing instructions during the wash cycle. Robust, easy to use and highly portable, the MediWash is the perfect solution for hospitals and healthcare facilities to hire in the event of a potential C diff or norovirus outbreak - or to ensure continuity of service during scheduled plumbing and building maintenance work. Please note: the MediWash can be hired as part of Teal's Task Force Service, a unique fast response service to deliver high quality hot water hand washing facilities on a next working day basis. Every Hygienius MediWash is sited and set up by trained Teal Task Force staff. Each unit is delivered complete with a generous supply of liquid soap and paper towels.